Lit up a KFC to have with coffee instead of my normal choice. Glad I did. I think it is a Churchill size. Lit easy with a very good draw. Started out very strong but after a few draws it mellowed out considerably, and stayed lit. Still a little strong for me as a first cigar of the day, but it will be a good smoke for late in the day with some good bourbon. Never got harsh and the flavor was constant. All in all a good cigar. Sorry, I had stopped looking for them and when I smoked one I had forgotten about martyd's original post. There could be some denseness going on here, but what's a KFC? Kentucky fire-cured by Drew Estate. Not bad for an occasional smoke... ?? Thanks Marty. I've had two of them, and thought they were fun and a good change from the usual. 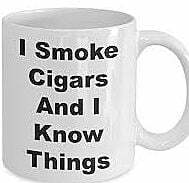 I'm saving one for a pipe-smoking buddy who doesn't like cigars, thinking a KFC might bridge the gap. The aroma is stronger than the taste. I've only had one, but I've had worse.